Today we will share detail guideline on tips policy in Hotel & Restaurant and some suggestions on how to increase tips. 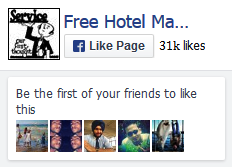 If you work in hotel & restaurant then must read this tutorial very carefully. A tip is considered as a monetary incentive which is given by the customers or guests for polite, prompt and efficient service provided by service staffs. Apart from this definition, there is another famou s definition which has given by Oxford Dictionary and that is “Tip means a small present of money given to an inferior”. This definition states that tip means a small incentive of money which is given directly to someone for performing a proficient service or task. The practice of giving tips has been continuing from very long time and particularly got popularity in service industries like hotels and restaurants. 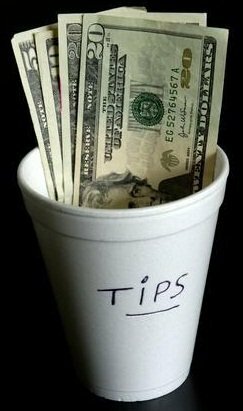 Tipping has become a recognized practice by the clients who tip the service staffs since they expect tip from their customers for their service. Giving tip or tipping is not the policy of the hotel even it is not mandatory for the guests to leave any tip after receiving service, but tipping is traditional. Tips are incentives for the service personnel to motivate them do a good job. Moreover, tipping is very important for a server since a server’s base pay is low. Tips add some extra earning in their low payment. However the amount of tip could vary according to the given service, for example, if the guest is very satisfied with the service then the tip will usually be good and if the service is not very good or below average then the guest may reluctant to provide any tip or give very little amount of tip. Usually, the amount of the tip ranges from 10% to 20% of the total amount of the guest check. There are no basic requirements for giving tips. Sometimes tipping is based on the quality of food or sometimes tipping depends on the attention given by the server to the guests even sometimes tipping also could be varied according to the mood of the guests. Hence, the servers not only should concentrate on their service quality but also they should ensure qualitative foods with the kitchen so that the size of their tips is not reduced. However, a good and professional server should not worry or always expects tips from a regular guest as regular guests can give the hotel/restaurant a good recommendation along repeat business. The servers should always provide steady and efficient service whether the guest is willing to give tips or not. But, some servers take tips for granted and do make any effort to perform additional service for receiving tips. This unprofessional attitude of the servers may arise from the kind behavior of guests who tip 15 to 20 percent of the bill regardless of the poor quality of the service which lead the server to become apathetic about the good service. However now a day the servers have become more sensible and put extra effort while serving the guests since the guests are becoming more concerned toward good service and value minded and they reluctant to give any tips if the service is not satisfactory. Tipping is usually based on the total bills without tax. Although the ultimate decision is completely depend on the guest’s decision, the minimum amount for giving tip should be at least 10% for adequate service. Guests also sometimes give tips for valet parking which is usually 1 or 2 dollars or higher. In fine-dining establishments, Maitre d’s also receive tips especially if they provide any extra service to the guests. 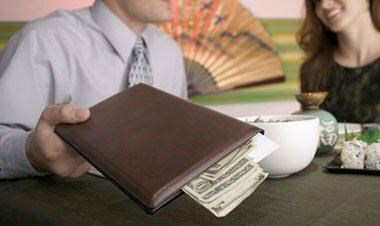 Tipping may be executed in various ways, such as: the guests may give tip in your hand or keep the tip in the table or add the tip with the bill. If the tip is handed to any server then he or she should thank the guest politely or if it is left on the table then the service associate should collect the tip before clearing the table. Sometimes the tip is added to the charge slip by the guest or added automatically to the check by the hotel/restaurant, in such cases the servers will have to receive it from the cashier or in his/her paycheck. In some hotels or restaurants, the servers also have to share a percentage of tips with the bussers, drink runners, expeditors, and other assistants. If the servers split a tip then the tip-per should state the division. 15 to 20 percent of the non tax total is often given to the captain, but some just slip them a $10 or $20 bill. Servers have lots of opportunities to increase the tip or they can influence the guests to provide them a fair tip. Professional service, greater sales along with increased repeat business can generate higher amount of tip for a server. Serve the guest with highest level of service. Maintain tidy and neat appearance of the surroundings. Greet guest in a friendly and polite manner. Provide helpful, supportive and efficient attitude. Always serve guest with a smiling face and natural tone. During the meal, continuously take updates of guest and ask whether the guests are in need of service by saying “Is everything all right?” or “How is your food?” If there is a problem or guest needs anything then attain and solve it immediately. Ensure prompt service and serve order within shortest possible time. Always serve items from the left hand side of the guest. Serve main food items to the guest following six o’clock position. Hold glassware by the stem and place it on the table carefully. Pour water in the glasses until two-thirds full. Offer all bar beverages with a napkin and coaster. Pour water and coffee for guests when required. After completion of the meal, clear the table immediately from the guest’s right side. Collect soiled and leftover food on tray or bus pan and cover it with a napkin. Bid farewell guest properly and thank guests as they leave by saying “Thank you sir for coming and enjoy a nice day”.